With the introduction of VMware vSphere 5, VMware introduces a new licensing model. VMware will retain a per processor model but they removed some restrictions which were in the vSphere 4 licensing model. This is mainly regarding the number of cores per processor and the amount of physical memory in a host on which vSphere 4 could be deployed. With vSphere 5 it does no longer matter how many cores or amount of memory a ESXi hosts has. Instead of the physical restrictions, VMware introduces a single virtualization based entitlement of pooled virtual memory (vRAM). According to VMware, this will simplify the process of purchasing deploying and managing vSphere while facilitating the move to shared infrastructure as a service. 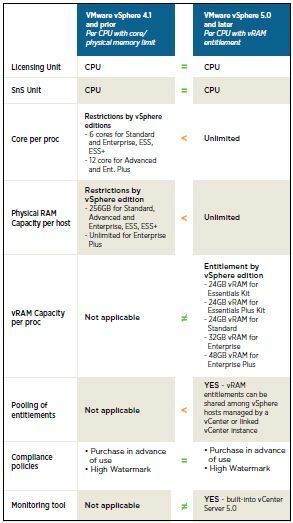 vSphere 5.0 will be licensed on a per-processor basis with a vRAM entitlement. Each vSphere 5.0 CPU license will entitle the customer to a specific amount of vRAM, or memory configured to virtual machines. 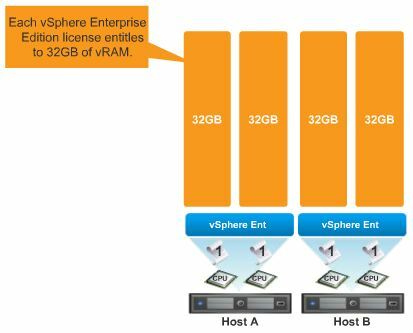 The vRAM entitlement can be pooled across a vSphere environment to enable a true cloud or utility based IT consumption model. Simplicity – Removes two physical constraints (core and physical RAM), replacing them with a single virtual entitlement (vRAM). Customers now have a clear path to license vSphere on next-generation hardware configurations. Flexibility – Extends the concept of resource pooling from technology to the business of IT by allowing aggregation and sharing of vRAM entitlement across a large pool of servers. 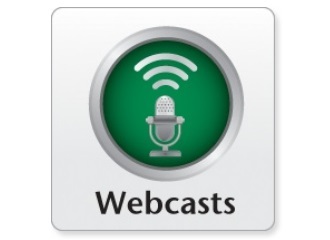 Fairness – Better aligns cost with actual use and value derived,rather than with hardware configurations and capacity. Evolution – Allows customers to evolve to a cloud-like “pay for consumption” model without disrupting established purchasing, deployment and license-management practices and processes. In all fairness, with this VMware introduced the much criticized virtual machine based licensing ‘with a twist’. Because they now license based on the amount of allocated vRAM, you’re much more limited in the total number of deployed virtual machines than you where when you were limited by physical memory and processor cores. I’m afraid this may backfire on VMware, especially when in competition with Microsoft or Citrix. I also see an upside though, this may prevent customers from physical-server-like sizing and over-provisioning virtual machines with way too much memory. So, in simple words, you buy a processor based license which entitles your to a limited amount of vRAM per processor. You can then pool all vRAM entitlements across your complete vSphere 5 virtual infrastructure. The total amount of memory allocated to virtual machines (vRAM) must be equal or lower than the total pooled vRAM capacity. You can increase the pooled vRAM capacity, if necessary, by adding more vSphere CPU licenses of the same edition to the vRAM pool. This could create a strange situation where you have more vSphere processor licenses than the total number of physical sockets/processors in your environment, just to measure up to your memory needs. Alternatively, you can upgrade all processor licenses in the vRAM pool to a vSphere edition with a higher base vRAM entitlement. To prevent a sudden shortage of vRAM capacity, you can monitor the amount of pooled vRAM capacity available and consumed using the licensing-management module of VMware vCenter Server. Customers can create reports and set up alerts to obtain automated notification of when the level of vRAM consumption surpasses a specified level of the available pooled capacity. In an environment with two hosts each containing two processors, licensed with a VMware vSphere Enterprise license per processor. Each processor license entitles the customer to 32GB of vRAM. Instead of using silos of vRAM where each processor has only 32GB of vRAM to use, you can pool the total amount of vRAM across the entire environment. So one processor may use more than 32GB of vRAM, when another processor is using less. So with pooling you create a vRAM pool of 128GB for your total virtual environment. When you now create 20 virtual machines with 4GB of vRAM each, you utilize 80GB of vRAM from your pool. So this environment is compliant with its vSphere 5 license model. 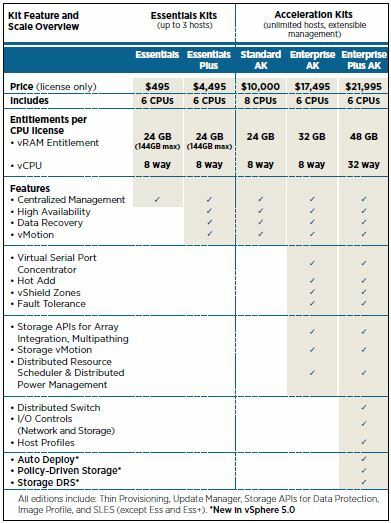 In the table on the left is an overview of the vSphere 5 version which are available. 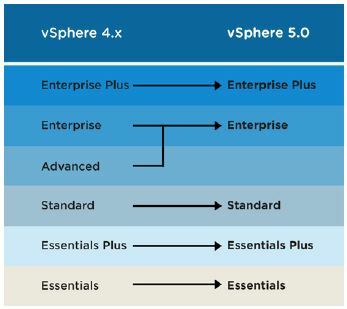 with the release of vSphere 5, VMware has dropped the vSphere Advanced edition. You can also see the amount of vRAM licensed with each version. When you’re now designing a new virtual infrastructure or are planning to extend your existing one you need to look beyond the features to determine the needed vSphere license. 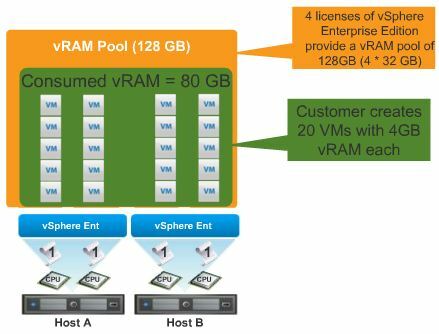 You first need to determine the required vSphere features and add the amount of vRAM required. If the amount of required vRAM is within the license limits, you’re done. However, when you exceed the vRAM license limit you can add additional processor licenses within the same vSphere license version or choose to buy a more feature rich version of vSphere. The next ‘challenge’ is to migrate customers from the old to the new vSphere license model. This is pretty straight forward, Essentials to Essentials, Standard to Standard, Enterprise Plus to Enterprise Plus. The only in-consequent scenario is when a customer has vSphere Advanced edition licenses. As mentioned above, VMware has dropped this version. But to compensate vSphere Advanced licensed customers they receive a vSphere Enterprise license instead. Now, this is really none of VMware’s business is it? If a customer chooses to be generous with allotted RAM on their VM’s then that’s up to them, they bought and paid for the RAM, not VMware. They’re trying to tax off of HW-vendors value-add. So VMware “removing” these restrictions and replacing them with vRAM restriction isn’t a give-away. VMware wants to have their cake and eat it and they want to eat their customers cake as well. RAM is the most constrained piece of HW in most ESX servers today and since prices are low, customers are buying in abundance. This is going double and triple the cost for close to 100% of all the customers I know. I think most customers understand the license model. What I hope VMware learned today was not that we didn’t understand it, but that we HATE it. I know these rules make the blades I purchase with 144GB and 2 sockets immediately not likely to be used for vSphere 5. 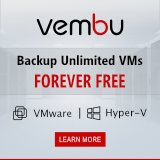 We have 20 and 32 GB VMs on Enterprise Plus license. Ignoring the whole ESXi issue (Model T analogy), this version seems more geared to improving VMware’s bottomline than improving customer’s network. I appreciate the storage continued enhancements, but things requiring Enterprise Plus for Auto Deploy just smell of trying to push Enterprise customers. VMware changed the licensing model after customer complaints, now you can keep purchasing 144GB, 2 socket blades with Enterprise Plus. Enterprise Plus now entitles you to 96GB vRAM, so 192GB for a 2 socket system. I think the overall opinion on the new licensing model is ‘negative’. I realize that in times of ever increasing number of CPU cores per socket, VMware never raised their prizes and customers got more power for their money. But this new licensing model just makes no sense in my opinion and in these times of fierce competition I think this will backfire on VMware. I understand Vmware’s need to get ahead of the ever-increasing cores-per-CPU and find a way to increase the revenue as modern CPUs where eating out the revenue due to higher consolidation rate. But the ridiculously low limitations is going to make us first diverse with sticking to v4.1 for test-systems and v5 for production. We have a consolidation ratio of 20-1 and will need a lot new licenses to satisfy the vRAM license rule. At a later stage it’s going to make us look closer at Citrix and/or in the long run at Microsoft. I feel that Vmware has made a huge misscalculation with the current license model sizing. Now, had Vmware made this limitation on the physical RAM instead of vRAM, then I probably would have been much less negative to the whole affair. I personally think that if VMware makes the switch completely towards vRAM licensing that would help a bunch, because you are talking about paying for resources you use all the way. Could make a trade in for the current vSphere CPU based licenses for vRAM entitlements with specific numbers, where I think 64GB per Enterprise+ license, 32Gb per Enterprise, 16 GB per standard would seem fair. Feel better paying for additional vRAM along vs. vRAM along w/ processor that isn’t needed. I think this is going to make a pretty compelling reason to migrate to Hyper-V in the next year or two. Check out this blog http://www.aidanfinn.com/?p=11328 – hard to argue with the numbers…and management is always going to like any savings we can show them. That’s why VMware changed their licensing model, doubling the amount of vRAM, introducing a VM vRAM licensing limit and a 12 month vRAM average. If I need to have 1Tb of vRAM in my cluster, it will cost me around us$400k in licensing??? Today we license a 1TB DL980 G7 with 8 Procs for less than U$33K. That not necessarily true. It all depends on the amount of hosts and virtual machines in your cluster and the memory configuration of those virtual machines. Pricing only based on the amount of physical memory is not correct. It’s based on the average amount of virtual memory you have allocated to virtual machines over a 12 month period.